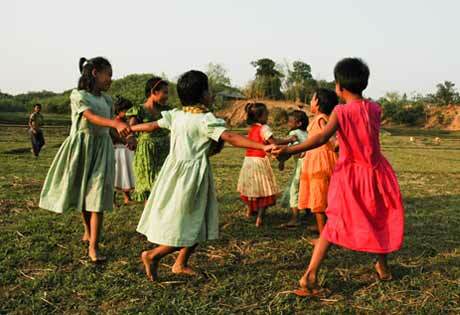 Since 1950 World Vision has been providing humanitarian aid on a global scale. Their staff of 45,000+ work around the clock and around the globe, with a presence in over 100 countries. Whether it’s child protection, health, education, water sanitation, disaster relief, etc., World Vision is committed to helping as the largest international nonprofit organization in the entire world. In years past, World Vision had been using Quickbase company-wide. While Quickbase did satisfy their needs, they recently changed their pricing scheme in a manner that would have drastically increased World Vision’s overhead costs. In need of continued functionality at a feasible price, World Vision turned to Cloudbakers. When Cloudbakers got the call from Mishadi Perera, it was made clear that they were in a true time crunch. Due to the circumstances, World Vision only had 7-8 days to fully migrate off of Quickbase and onto another platform before the structure of their data would be lost. Luckily, Zoho Creator not only offered the functionality and price point World Vision needed, it was also extremely easy to migrate to--Cloudbakers was able to perform the full migration in just 2 days, including all Quickbase Data and the actual development of the application. 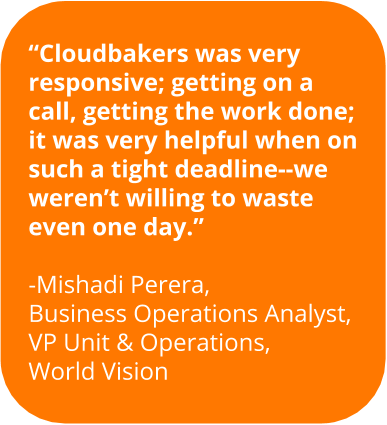 The program Cloudbakers developed for World Vision allowed them to complete several tasks. First and foremost, it provided them with a tracking system for employees being out of the office. Second, it provided a repository for all of their contacts (phone numbers, emails, etc.) and gave shared access to those contacts. Finally, the platform allowed World Vision to utilize numerous digitized forms. Signing up and verifying volunteers, donation requests, and tons of other internal processes have been simplified and made digital. When they first got on the phone with Mishadi, the team knew right away that they needed to open up a Zoho Creator project for them. The needs they described fit the description of Zoho Creator to a tee: online, accessible forms, a database to run reports, and automation based on information entered by their employees. Not to mention the relationships World Vision needed between different tables. It wasn’t until the discovery call with the World Vision team that they found out they had to migrate their applications from Quickbase on such short notice. Canceling all plans for the next two days, the entire team went to work analyzing the use of quickbase and replicating their current functionality while enhancing the automations in Zoho Creator. They were able to make forms more dynamic, showing and hiding fields that were unnecessary and prepopulating redundant information as users filled out the form. Shortly after confirming the new functionality with the World Vision team, they began the data migration. The conversion was very smooth with the help of custom functions to import each of the data sets along with the CSV imports provided by Zoho Creator. In two days, the team put together a fully functioning World Vision project and employee tracking system with the ability for all of their users to log in anywhere in the world. Fully functional on Zoho Creator, the World Vision was able to continue business as normal with minimal interruption, save financially, and adopt a platform that helps them do what they do best: help others.